Innovation is difficult to bring. It takes a genius minds or many to come up with an innovative idea and a lot more efforts to materialize this idea. An innovative idea in its true meanings is one that helps and facilitates not only the people but our planet earth as a whole. While we are making our lives easier with innovative products constantly we must give our planet some space to breathe too. ZmartFrame is one innovative idea that hits right in the middle. This idea is truly innovative and directed at not only the benefits of people but the planet as a whole. ZmartFrame takes an aim at a very common problem in an amazingly ingenious way. 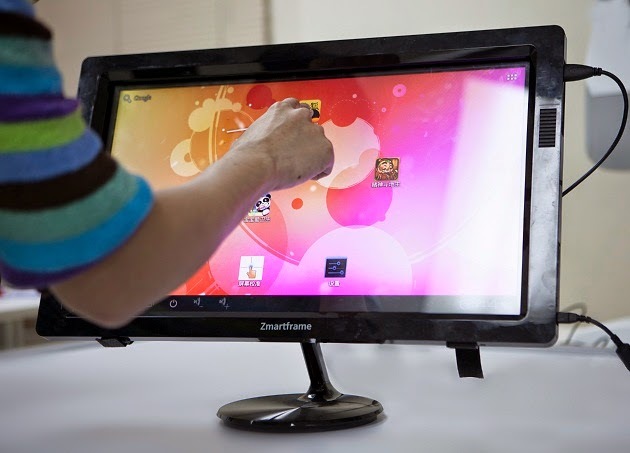 It consists of a frame that transforms old and conventional monitors into touchscreen main units. More and more people are switching to touchscreen monitors and devices and ZmartFrame is your way of moving in the same direction but through affordable means. This is a simple 4-sided frame that fits onto your old monitor and converts it into a touchscreen unit. The package contains of a frame, a few cables and an adapter that will bring you to the touchscreen world. First, you are getting to enter the touchscreen world without having to afford an expensive device that might cost you close to $1000. Secondly, you will be able to operate your old screen with multi-touch. You can use 2 fingers on the screen to do numerous tasks – it’s more like using a tablet or smartphone. You can easily transform your old monitor that are 19, 22 or 24-inch in size. The creators of this great product are constantly coming up with new cool stuff and so you can get one of the many cool items they offering to enhance your touchscreen experience. This product is innovative and its benefits are numerous. First, you will not have to dispose your old monitor and increase the e-waste on our planet. Secondly, you won’t have to spend thousands of dollars in replacing your old computer system to get the touchscreen technology. You will be able to do everything right from your monitor i.e. from browsing on the internet to using an on-screen keyboard to type everything you want. With the embedded Android touch PC you will gain access to millions of applications that are available from Android store to only those users who use Android devices. Yes, this innovative idea doesn’t come from a big Fortune 500 company. The creators of this amazing product are some experts with genius minds who have come to one platform to present their valuable services for facilitating the people and their home, the earth. These people need funds to promote their wonderful product and make it reach every corner of the world so more and more old monitors can be prevented from being wasted as e-waste. You can look for ZmartFrame on any search engine and make your contribution towards innovation and improvement.